It’s less than 10 8 hours till the start of the opening ceremonies—Let the Ravelympics begin! So last night and this morning—I was hard at work finishing up the Fruity cowl. It’s a good reminder of why my Ravelympics project has a knit in place border! This border is endless. Last night I reached the half way point, and stopped and pinned it out for photo—it really does look pretty—the striped lace echo’s the striped pattern of the body nicely. But it goes on and on. I’ll bring it to work one day, and finish it—and then work non stop on my Ravelympics shawl for the remaining days as both a subway and home knitting project —the pressure is on to work on it, (and nothing else) –We’ll just gloss over the sweater (still sleeveless) that was my last winter knitting Olympics project. 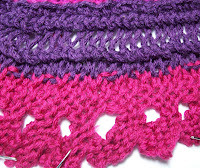 I might finish it one day—it is quite pretty (and I would like to have those needles back in circulation!) Maybe I’ll find a photo and blog about it (instead of blogging about my current project. Part of the problem is, it is a very warm sweater. And I so rarely need or want a very warm sweater! But I should finish it. I mean too... but. That is one of the problems with UFO’s (vs. Wips) you loose interest in them. The spark of an idea grew to a fire, and then suddenly the fire went out. Now the idea is ashes— and I will need to re-kindle interest to get it finished. I remember what happened—It was the last time I had the flu –one day I was fine, and then for the next 10 days, a rag. Washed out, fevery, unable to do anything but get up, excrete some fluid, replace with some fresh fluid, take some medicine, and go back to bed—only to repeat the process some 4 to 6 hours later. Day after day, too sick to do anything. By the time I was over the flu—the Olympics had ended, and the sweater was still sleeveless. By the time I thought to pick it up again, and get to work--Spring and warm weather was arriving and the heavy warm sweater had no appeal what so ever. But is still like the idea of it. The hyacinth socks keep insisting I should be working on them. (I am ignoring them… but I don’t want to!) --but I did work on a draft of the pattern--not just thinking but actually figuring out how many stitches, and how many rows of cuff, and the cuff pattern, and all the other details. Loving the fruity cowl. Will you post a picture of you wearing it when you're done?